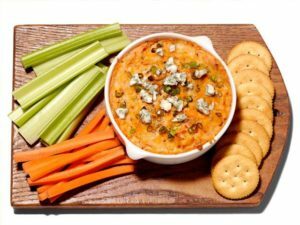 Host a spectacular Super Bowl party with these game-day recipes of crowd-pleasing finger foods and easy appetizers. From chicken wings and dips, to cheese balls and sliders, we’ve pulled a few popular options from The Food Network (channel 442 or 1442 in your TDS TV channel line-up). 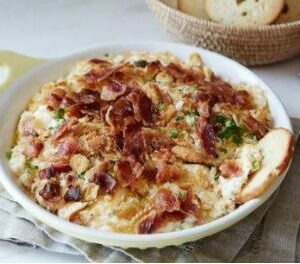 In a medium bowl, mix the mayonnaise, cream cheese, Cheddar cheese, Monterey Jack cheese, green onions and cayenne pepper. Transfer the mixture to a shallow baking dish, such as a 9-inch pie pan. Top the mixture with the cracker crumbs and bake until heated through, about 15 minutes. Remove the pan from the oven and top with the bacon. Serve immediately with corn chips, crackers or bagel chips. Mix 4 ounces softened cream cheese and 1/2 cup each sour cream and Frank’s RedHot sauce (or 1/4 cup other hot sauce); fold in 2 cups shredded rotisserie chicken. 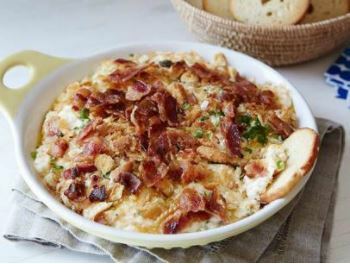 Spread in a small baking dish, sprinkle with celery seeds, chopped scallions and shredded cheddar and bake at 425 degrees F until bubbly, about 20 minutes. Top with crumbled blue cheese. Serve with celery and carrot sticks and crackers. Preheat the oven to 225 degrees F. Set the pork on a cutting board and score the fat in a crosshatch pattern, making the cuts about 3/4 inch deep and 1 inch apart. Make the rub: Combine the pimenton, garlic powder, cayenne pepper, brown sugar, celery salt, mustard powder and 1 1/2 teaspoons salt in a small bowl. Massage it into the meat. Place the pork in a roasting pan and pour the beer into the pan. Cover with foil and roast 3 hours. Check it periodically to make sure everything is going along just fine, and turn the roast over every hour. Remove the foil and continue roasting until the pork has reached an internal temperature of 190 degrees F, about 1 1/2 more hours. Remove from the oven, cover loosely with foil and let rest 30 minutes. Sometime during the marathon cooking time, make the sauce: Combine the vinegar, garlic, chile, brown sugar, tomato paste, dijon mustard and 1 1/2 teaspoons salt in a small saucepan and bring to a boil. Taste it to make sure it is delicious; set aside. Remove the chile. When the sauce is cool, I recommend putting it in a squeeze bottle for easy use. Pull the pork into long shreds using 2 forks. Get rid of the fat and anything else that doesn’t look delicious. Toss the pork with any residual pan juices and add salt to taste. Serve the pork on slider rolls with a drizzle of sauce; top with coleslaw. Heat the oil to 350 degrees F. in a deep-fryer or Dutch oven. In a 1-quart mixing bowl, stir the cornmeal, flour, onion, jalapeno, corn, and eggs, until blended. Allow to stand 5 minutes. Drop the batter by teaspoonfuls into the hot oil. Don’t overcrowd; leave room for the hushpuppies to be turned. Cook the hushpuppies until golden brown, about 3 minutes. Remove from the oil with a slotted spoon and drain on paper towels. Keep the cooked hushpuppies warm in an oven while cooking the remaining batter. Lightly sprinkle with salt and pepper, to taste, and transfer them to a serving dish. Serve with Paula Deen’s Sweet and Spicy Chili Sauce, if desired. Place a 6-quart saucepan, with a steamer basket and 1 inch of water in the bottom, over high heat, cover and bring to a boil. Remove the tips of the wings and discard or save for making stock. Use kitchen shears or a knife to separate the wings at the joint. Place the wings in the steamer basket, cover, reduce the heat to medium and steam 10 minutes. Remove the wings from the basket and carefully pat dry. 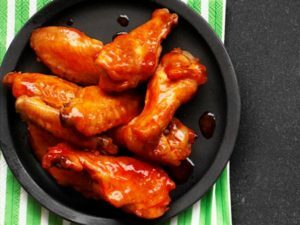 Lay out the wings on a cooling rack set in a half sheet pan lined with paper towels and place in the refrigerator to dry, about 1 hour. Preheat the oven to 425 degrees F. Remove the paper towels on the pan and replace with parchment paper. Roast on the middle rack of the oven, about 20 minutes. Turn the wings over and cook 20 to 30 more minutes, or until the meat is cooked through and the skin is golden brown. While the chicken is roasting, melt the butter in a small bowl with the garlic. Pour this along with the hot sauce and 1/2 teaspoon salt into a bowl large enough to hold all of the chicken and stir to combine. Remove the wings from the oven, transfer to the bowl and toss with the sauce. Serve warm. If you still need more inspiration, there are lots more recipes to be found at FoodNetwork.com. And, don’t forget that this year’s Super Bowl starts at 5:30 CST on NBC! All images courtesy of Food Network. Cheryl McCollum is an Associate Manager of Public Relations at TDS Telecom. She has 25 years of media experience. She’s worked as a newspaper reporter in Northfield, Minn., and Beaver Dam, Wi. She worked in media relations and advocacy for the Wisconsin Medical Society and the Wisconsin Bankers Association. She also worked in communications and advocacy for Habitat for Humanity of Dane County. She has a Journalism and Political Science degree from the University of Wisconsin-Madison. She’s married, has two adult children and enjoys traveling, especially to U.S. state capitols.